Wizteach 4 is an annotation software with 70+ subject-specific tools for drawing, math, literacy, geography, science and 8 polling questions types with reporting. Wizteach 4 is an annotation software with 70+ subject-specific tools for drawing, math, literacy, geography, science and 8 polling questions types with reporting. It works over all applications, including web browser content, and it collaborates with tablets using local wifi. It has a fully customizable presenter tool pallet. Tablet users can join a Wizteach 4 session using Qwizdom Notes+ which available to download from the istore / play store. WizTeach software now comes bundled with 5 student licenses of the Notes Plus application. The web app allows up to 5 students to view a live lesson, respond, share annotations, take notes, and save presentations for review using any tablet or laptop. Upgrades to class and site licenses are available. Presenters share content as students follow along on their personal devices, answering questions and sharing annotations. Simultaneously assess understanding and maximize instruction using built-in response tools. Enhanced multi-pen and multi-touch capabilities allow students to simultaneously use and manipulate WizTeach tools using any interactive projector or whiteboard. WizTeach is different than any other interactive whiteboard/projector software. Not only does it sit over your desktop, it also sits over any other application, such as office programs, video software, existing teaching resources, websites, etc. WizTeach 4 has a fully customizable tool pallet which will make the software easier to use and incredibly familiar for the presenter. Avoid a one-size-fits-all, off-the-shelf user experience—individualize learning with customized presenter software. Image Gallery with 3100+ images including Architecture, Math & Science Charts, Animals, Geography, and much much more. Practicing math has never been so much fun. Perform calculations or manipulate complex fractions. Measure straight lines, work out angles or determine the workings of a circle. Convert between units of weight, distance, volume, temperature and time. Create and explore prisms, pyramids and nets. Use interactive tools to build and illustrate circuits. Collect, measure, and document findings using easy-to-use rulers, charts, and diagrams. Examine and discuss the elements with a dynamic, touch-friendly periodic table. 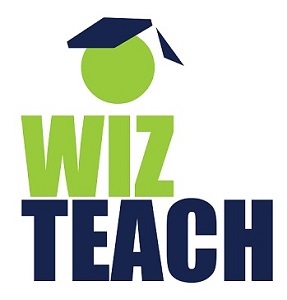 WizTeach geography tools provide a whole new approach to facilitating lessons and activities. Bring life to lessons by collecting accurate weather data using Weather Bug, incorporating weather symbols and thermometer tools to augment data, and using a variety of maps via the Google map application. Geography tools allow teachers to bring lessons into the real world, showing real locations and real time data. WizTeach literacy tools and games help turn the classroom into a vibrant and interactive learning zone. Provide new ways for students to explore the wonderful world of words with activities such as Word and Sentence Builder, Word Scramble, and Word Hunt. Help students to discover and learn new ways to identify new words and their meanings.